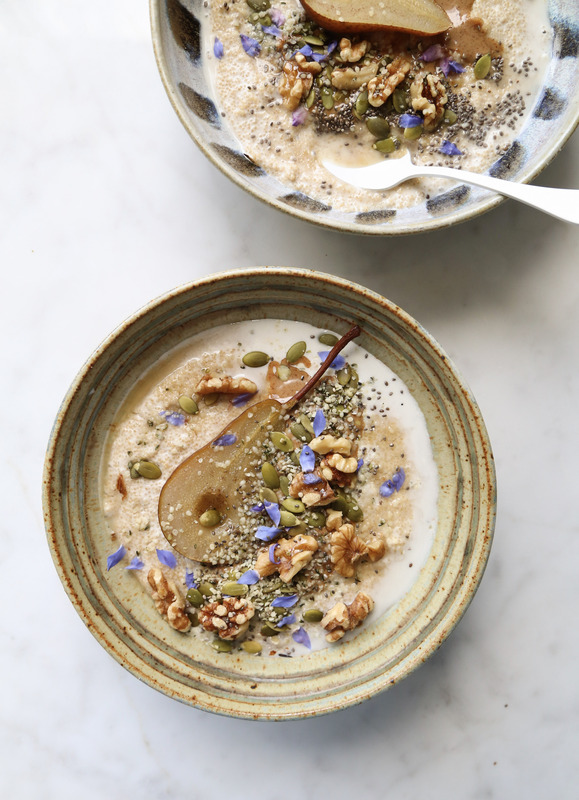 A restaurant in London, 26 Grains, inspired this breakfast bowl recipe. I came across their account on Instagram and was in awe of their gorgeous oat bowls with the most delicious ingredients, such as stewed fruits, seeds and nut butters. Always willing to experience something new, I decided to use amaranth in this breakfast recipe. Amaranth is a super grain that you need to try. It was a stable crop of the Aztecs for thousands of years. In Nepal, India, and Mexico it is traditionally enjoyed as a breakfast cereal. It has become popular worldwide because of the remarkable health benefits. It’s gluten-free, super high in protein, and is packed with vitamins and minerals. When it comes to nut milk I always find that store-bought doesn’t taste nearly as good as making it yourself. For that reason I have provided a cashew milk recipe. If you don’t care to make your own milk then feel free to buy it. My favourite nut milk brands are Forager Project and Malk because they taste the most like homemade. Please feel free to have fun with this recipe and choose your favourite toppings. The prettier you make it the tastier it will be, it’s a fact. 4 ripe but firm bosc pear, halved lengthwise with seeds scraped out. Cover cashews with boiling water. Sit for 5 minutes. Place in a high speed blender with water and blend until very smooth. Stir in vanilla extract. Stir in just enough cashew milk until porridge is creamy enough to your liking, about 1/2 cup. Serve amaranth warm with poached pears, toppings, and more cashew milk if desired. *If preparing in advance, simply prep the grains up until step 1. Continue with step 2. **The poached pears can be made in advance and refrigerated. This entry was posted in Breakfast and tagged amaranth, breakfast, cashews, gluten-free, grains, nut milk, pears, plant food, seeds, superfoods, Vegan. Bookmark the permalink.